I haven’t been on Architizer yet, because it seems like every other week a new social networking site pops up and promises to revolutionize how we connect to each other (remember Friendster and MySpace? ), even though in my opinion even the 500 pound gorilla of social sites (Facebook) seems to have changed nothing except for how I kill 10 minutes every day. Somebody has got to have a better idea for something to do with the technology we now have to connect each other. But there’s a great article by Alissa Walker of Fast Company here about architect websites. For the most part, I agree with her. Although I designed my websites (this one and this one) over two years ago and haven’t had the time to go back, when I think of how I would change them, I would strip things away as opposed to add them. I’m certainly not about to add one of those schlocky Flash based websites. As far as using digital media as an inquiry into space and experience, I think this video by Bartlett M.Arch candidate Keiichi Matsuda is right on the money. Many of you have probably heard of “augmented reality,” a name given to the convergence of wireless media and location-based technologies. In a way, this video reminds me of the work of Thomas Demand (see below), whose photographs of paper constructed environments speak to the uncanny connection between our constructed, physical worlds and the parallel world created by our visual technologies. More information on Matsuda can be found here. What do you think of the difference between this video and the one by SO-IL in the post before this one? Well, I managed to post all of my film notes from my first semester running the Yale Architecture Film Society (only four more semesters to go!). I’m sorry that I’m (and will be) posting out-dated stuff for a little while longer, but I hope to intersperse these old film notes with some new comments on media/architecture/design as well. There are some other things I’d like to change, as well, but don’t really know how to go about doing quite yet. First of all is the look of this blog. I’m using the WordPress.com theme called “White as Milk,” which is nice because of its simplicity and legibility, but there are so many things I would change about it (if I knew how). It sort of goes along with a discussion I’ve been having about a friend recently about web page design: my favorite web pages are starkly minimal–the webpage for the graphic design firm 2×4, Hedi Slimane’s photographic diary, or the old webpages for Helmut Lang and Jil Sander (they’ve since changed, are now less minimal, and they’re now Flash based). 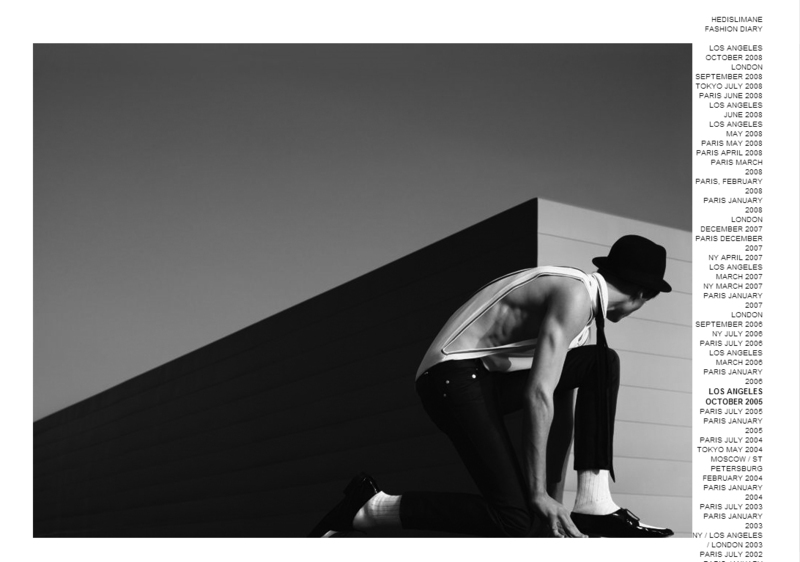 In fact, I have a hard time thinking of websites that are more beautiful than the ones designed by Hedi Slimane. However, it seems the most popular blogs are intentionally cluttered and chaotic, for example, the websites for the most popular blogs, like Gizmodo, Gawker, and New York Magazine. I don’t know why this is the case. Why do people seem to prefer visual clutter on the internet?